Conquest Air Cargo Convair C-131B N145GT (msn 256) (above and below) has ditched in the Atlantic Ocean 23 miles off the coast from Bali Harbor, FL today. One person was rescued, one person is missing. Above Copyright Photo: Conquest Air Cargo Convair C-131B N145GT (msn 256) OPF (Arnd Wolf). Image: 945649. Conquest Air Cargo flight 504 departed from Nassau, Bahamas and was headed to Miami-Opa-locka Executive Airport (OPF) when it crashed in the Atlantic Ocean about 12:15 p.m.
Conquest Air Cargo is a cargo airline providing daily service to Nassau, Bahamas and service as needed to Freeport, Abaco, and the Caribbean from Opa-locka Airport. Carlos Gomez is the owner. Carlos Gomez has built a solid reputation in the aviation industry since buying his first cargo aircraft at the age of 23 in 1988, a Douglas DC-6. All photos by the company. 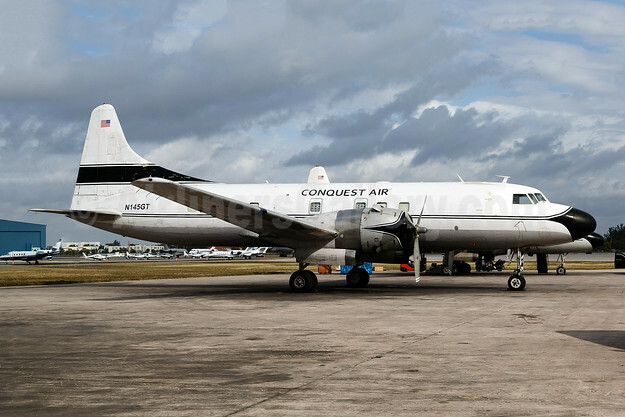 This entry was posted in Conquest Air Cargo and tagged Conquest Air Cargo, Convair C-131B, N145GT on February 8, 2019 by Bruce Drum.